Salt Lake Community College culinary arts students baked gingerbread houses that are now on display the Wellington Senior Center in Salt Lake City. The village is part of the program’s Holiday Open House. The houses will be auctioned off to benefit the Cancer Wellness House. View some of the student creations in this photo gallery. A gingerbread church created by SLCC culinary arts students. Every house will be auctioned off Dec. 10 to benefit the Cancer Wellness House. Gingerbread houses built by SLCC culinary arts students are on display at Wellington Senior Center. Visitors to Wellington Senior Center can admire the gingerbread village created by SLCC culinary arts students. A gingerbread cottage with icing pine tree. Every gingerbread house will be auctioned off Dec. 10 to benefit the Cancer Wellness House. This gingerbread monastery has a pretzel exterior. This and many other gingerbread houses were created by SLCC culinary arts students. Some SLCC gingerbread houses have extras like snow frosting on the ground and candy pathways. A candy sleigh sits on display in the SLCC gingerbread village at Wellington Senior Center. 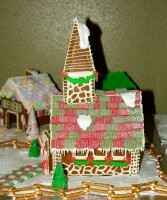 All gingerbread creations will be auctioned off Dec. 10 to benefit the Cancer Wellness House. Gingerbread houses created by SLCC culinary arts students. The houses will be auctioned off Dec. 10 at Wellington Senior Cetner.